We build VR/AR/MR facilities for universities and businesses. Hardware, software, installations, maintenance, professional development - the works. VR/AR/MR are already major tech platforms. Whether for research, workforce development, or curriculum: get prepared, don't play catch up. WorldViz has 15 years of experience doing world-class installations, starting w/ the groundbreaking Virtual Human Interaction Lab at Stanford University. We're thrilled to have set up this installation, one which has produced some of the leading research in the field. The mission of the Virtual Human Interaction Lab (VHIL) is to understand the dynamics and implications of interactions among people in immersive virtual reality simulations (VR) and other forms of media (eg digital communication systems, video games, etc). Researchers in the lab are most concerned with understanding the social interaction that occurs within the confines of VR, and the majority of their work is centered on using empirical behavioral science methodologies to observe people as they interact in these digital worlds. It is sometimes necessary to develop new gesture tracking systems, three-dimensional modeling techniques, or agent-behavior algorithms in order to answer these basic social questions. Read the full case study here. With well over 1,000 square meters of space to freely walk around in, the HIVE (Huge Immersive Virtual Environment) of Miami University at Ohio may currently be the largest VR space in the world: Powered by WorldViz PPT warehouse-scale motion tracking, this VR installation leverages the university‘s research work across several disciplines: From developing medical training simulations for their nursing program to building a 3D mandala for the Daila Lama, virtual reality has not only become a standard tool for the university’s students and faculty, but for their regional, national, and international industry partners alike. Read the full case study here. In 2013, the Office of Diversity and Inclusion at ERAU, created a virtual reality simulation lab called Pre-Board. Dr. Robin Roberts put forth an innovative initiative to build a virtual reality lab after realizing that many of the University’s Global Engagement Students (Study Abroad) were experiencing severe culture shock. ERAU immersed students in simulated, foreign environments, thereby reducing their fears resulting in increased confidence. Over the past two years, Pre-Board’s applications have evolved and expanded under the direction of Kenneth Hunt, Director the Office of Diversity and Inclusion at ERAU. Embry-Riddle students and faculty are now able to practice and implement core skills in preparation for becoming professionals after graduation. According to Mr. Hunt, “I have been fortunate enough to be involved in the creation and expansion of the VR lab and its effect campus wide. Participation has resulted in a stronger bond between students, faculty and staff who have shared the experience together”. A key theme in the greater architectural narrative has been effectively envisioning and exploring what has not yet been built. Over the years, the story has been driven by innovations in display and representational tools - whether through blueprints, models, drawings, computer animations, or other tools. A leading Midwest school in architecture has taken the story’s next big step by implementing immersive virtual reality (VR) in its classrooms and labs to research its use in iterative design and enhanced presentation tools. With a WorldViz facility and software, Ball State’s College of Architecture and Planning (CAP) achieved a significant reputation as a leader in new methodologies and procedures for architecture and design. 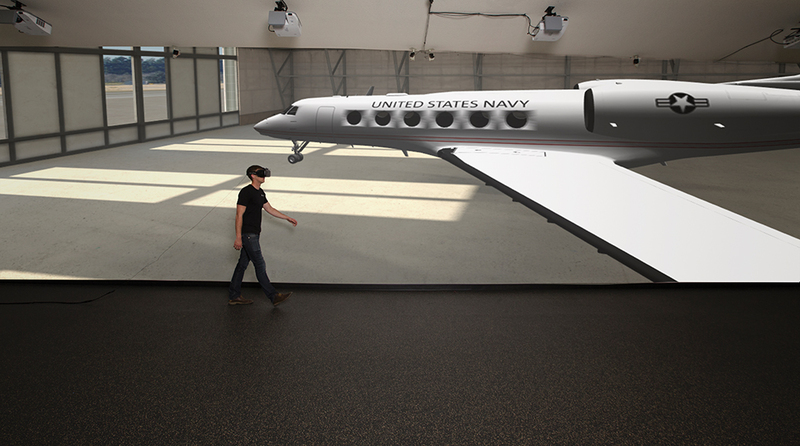 Ball State experimented with visualization solutions related to virtual reality, including early forms of augmented reality and stereoscopic rear-projection visualization systems. These tools were used for disciplines and departments as diverse as Building Architecture, Landscape Architecture and Urban Planning. WorldViz and Florida Gulf Coast University teamed up to build VIPER (Virtual Interactive Portal for Engineering Research) to drive virtual reality research and adoption across a range of disciplines at the university. The facility is equipped with an array of WorldViz PPT motion-sensing cameras, a wide-area WorldViz Walking VR system, and a Projection VR system. Sound is a huge component of immersion, and this facility has a powerful Dolby Atmos surround sound system. The use cases for the University are vast. “It has widespread applicability in all engineering disciplines,” Richard Behr (Dean of the Engineering School) said. “It can be used to simulate construction sites; you walk through the site in a virtual environment, and you can mitigate problems on the site during real construction. But you can also apply VR to civil engineering and environmental engineering." They are also excited about using the facility for medical education (e.g. inspecting 3D models of organs), training their students on VR development and 3D modeling, and creating immersive Math learning games. Read more about the VIPER lab here. Our team includes not just VR/AR/MR experts, but also researchers, instructional designers, trainers, teachers, and more. We have experience working with universities, businesses, and faculty, and we can lead workshops and trainings on everything we install. While we make software and hardware here at WorldViz, we're not interested in locking you in to them if it doesn't make sense. We have partnerships and expertise with a wide range of hardware and software providers and we work with you to choose the best solutions. We've been doing this for almost 15 years for some of the most prestigious institutions around the world. This isn't just about flashy press releases: we're committed to helping institutions leverage VR/AR/MR technology to drive innovation, impact, and results.